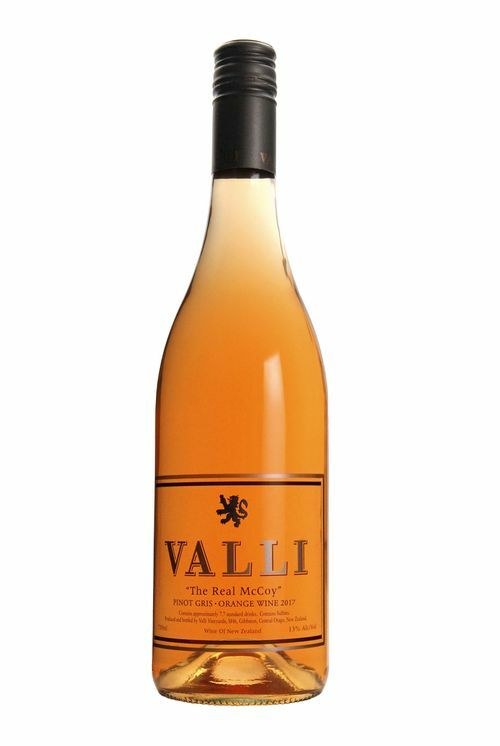 "Orange" wine is a category or genre of wine, sometimes referred to as "amber" or "skins ferment" wines. The category is defined by fermenting white grapes on skins, a technique more often used with red grapes. The spectrum of how the technique is deployed varies based on the producer or region and a range of grape varieties can be used. In 2017 we again selected Pinot Gris from our Gibbston vineyard with the two previous vintages showing us that the combination of this variety with the ancient technique and our beautifully fragrant subregion is a winning one. The pristine fruit in 2017 was a great incentive to experiment with more whole clusters in the fermentation (15%) and longer time on skins (40 days - double the amount of the 2016). The pressing decision was made on taste - on day 40 we found the wine was in perfect harmony. After 13 months in old Pinot Noir barrels and an additional 6 weeks in tank, the wine was bottled with no fining and no filtration. Each year we see a greater sense of place in our Valli Gibbston Pinot Noir and Pinot Gris and we continue to see our special place in the Real McCoy Orange Pinot Gris. This reinforces everything we believe about provenance and the importance of site. The colour of the wine comes from the grape skins and the semi-oxidative handling and is as unique as the character of the wine itself. A cooler vintage, 2017 had less colour in the skins to extract resulting in a wine with a more subtle colour of pale peach with a tangerine tinge. The nose is quite exotic with lychee, orchid, star anise, and cream soda. The palate is laden with tangerine, orange zest, pomegranate, nectarine and almond with beautiful fine tannin and fresh acidity that sings loudly of Gibbston. The Real McCoy gives exciting opportunities for food pairing including charcuterie platers, pork roast, risotto, grilled or poached salmon, Lebanese dishes, Indian cuisine, sushi, hard cheeses and a new favourite - fish and chips!" “The Real McCoy” Pinot Gris Orange Wine 2017 has sold out. Please contact hollis@valliwine.com to be notified of the next release. "Orange" wine is a category or genre of wine, sometimes referred to as "amber" or "skins ferment" wines. The category is defined by fermenting white grapes on skins, a technique more often used with red grapes. The spectrum of how the technique is deployed is varied based on producer or region and a range of varietals can be used. In 2016 we again selected Pinot Gris from our McCoy vineyard in Gibbston after our first release in 2015 showed us that the combination of this varietal with the ancient technique and our beautifully fragrant subregion is a winning one. The 2016 Real McCoy was made even more like we make our Pinot Noir - we increased the amount of time on skins from our first release (from 11 to 20 days) and added a small amount (5%) of whole clusters. It was bottled with no fining and no filtration and a turbidity of <15NTU! (This means the wine is naturally very clear). 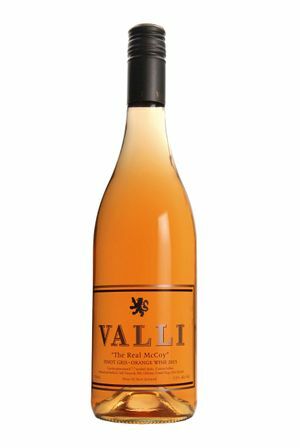 We've seen a strong sense of place years after year with Valli Gibbston Pinot Noir and from its inception with Valli Pinot Gris and we continue to see our special place in the Real McCoy Orange Pinot Gris. This reinforces everything we believe about provenance and the importance of site. The colour is light apricot, much like the lingering hue of an island sunset. This colour comes from the grape skins and the semi-oxidative handling and is as unique as the character of the wine itself. It is a shade darker in 2016 which was a warmer vintage.The nose is quite exotic, leaning towards tropical with lychee, papaya, orchid and star anise. The Tropical aromas continue on the palate adding pomegranate to the mix with beautiful fine tannin and fresh acidity that sings loudly of Gibbston. The Real McCoy gives exciting opportunities for food pairing including charcuterie platers, roasts (chicken, ham, pork, turkey), risotto, grilled or poached salmon. Lebanese dishes, Indian cuisine, sushi, and hard cheeses." "The colour is pale tangerine, glimmering towards orange in bright light. After the allure of the colour, the sensory experience continues with aromas of cream soda, lychee, cantaloupe and freshly grated nutmeg. The sojourn goes on with a vibrant palate filled by a creamy middle and delicate fine tannins. The flavours tend towards tropical and floral with a fresh acidity that sings loudly of Gibbston. The journey is rewarded by the exploration of food pairing: Charcuterie, Roasts (chicken, pork, ham, turkey); Confit of duck; Duck accented with stone fruit; Pea risotto with fresh mint and lemon; Moroccan tagine (lamb, chicken, fish); Grilled or poached salmon; Hard cheeses, Apricot tart with pear sorbet."